Happy Monday! I hope everyone enjoyed their weekend. With the holidays here, I'm sure a lot of you guys are traveling! 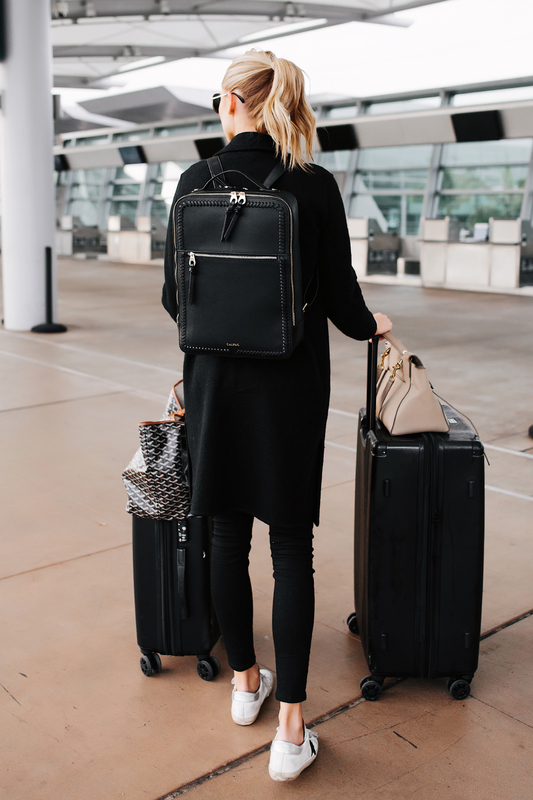 So today I wanted to share with you some of my favorite travel luggage as well as my airport style. For me, I always prefer to fly comfortably. This means you'll find me in sneakers, a cozy sweater, and some sort of layering item. 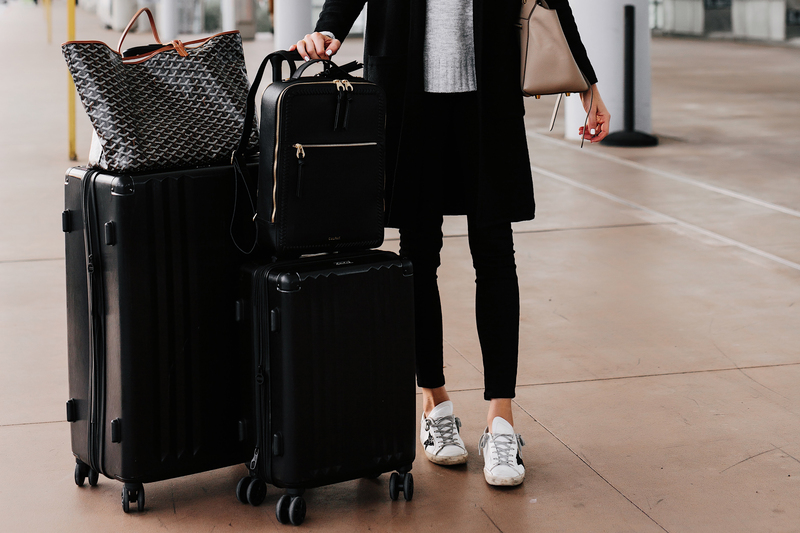 When I flew to London last month, I wore my favorite high-waist leggings, but when traveling shorter distances I typically wear my favorite stretch jeans from Everlane. Since I'm always pretty chilly on the plane, I live in sweaters & layering items. I recently picked up this tunic sweater and seriously love it so much! It's incredibly cozy, plus it comes in 9 colors and is under $60! For layering I will typically wear my heaviest coat/jacket that I'm taking with me on the trip. If I'm going somewhere where a coat/jacket isn't needed, I'll opt for something a little less bulky. This coatigan is the perfect layering piece! 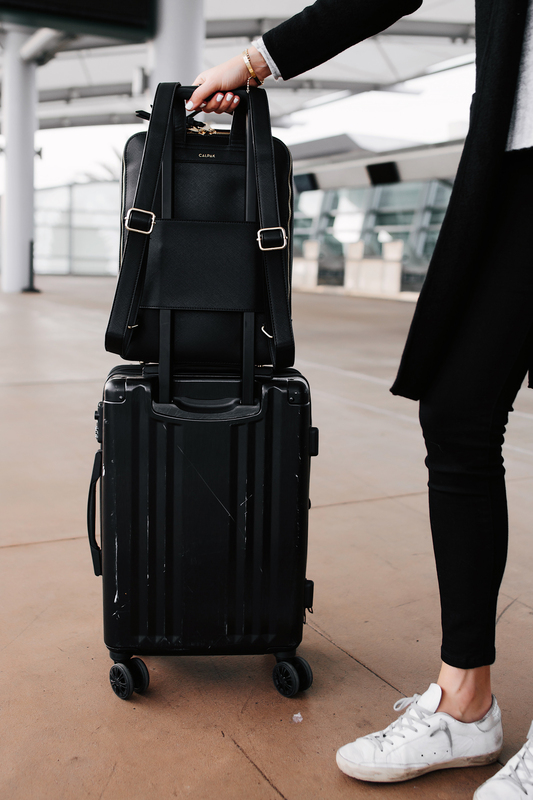 So many of you guys have asked about my Rimowa luggage, and while I think it's so pretty, it's honestly not my favorite luggage, especially for the price. I wanted to find something that I could genuinely share with you that I love, and when I used this Calpak set, it instantly became my new favorite. I got both pieces for under $300 which is such a great deal! 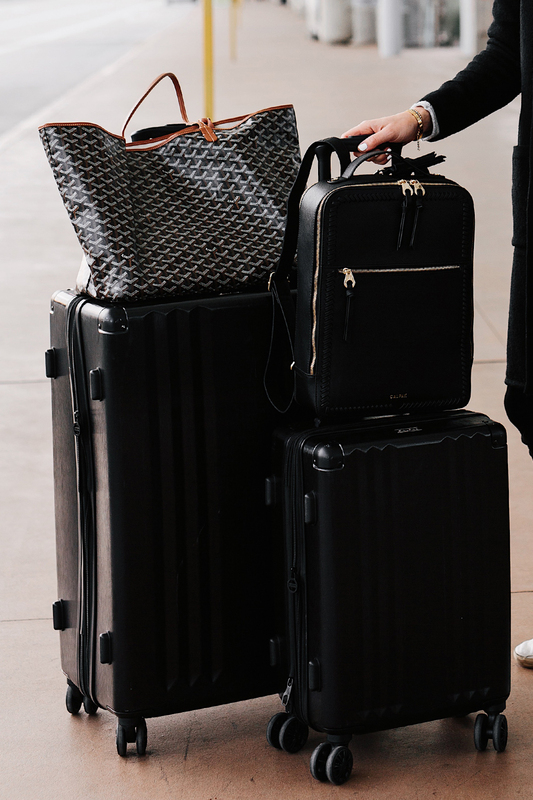 The luggage is so spacious, and they both have expanders which I always take advantage of (the Rimowa does not). I was a little worried about the durability, but it made it from San Diego to London and back with only minor scratches. I recently became a HUGE FAN of packing cubes. I used these on my trip to London and will never not them again. I couldn't believe how much space I saved! These packing organizers by Truffle are also great pieces to have. I use them to keep my cords/electronics, beauty products, and everyday essentials all organized. I also love this new Calpak backpack I recently purchased. It keeps my laptop and everything so organized inside. 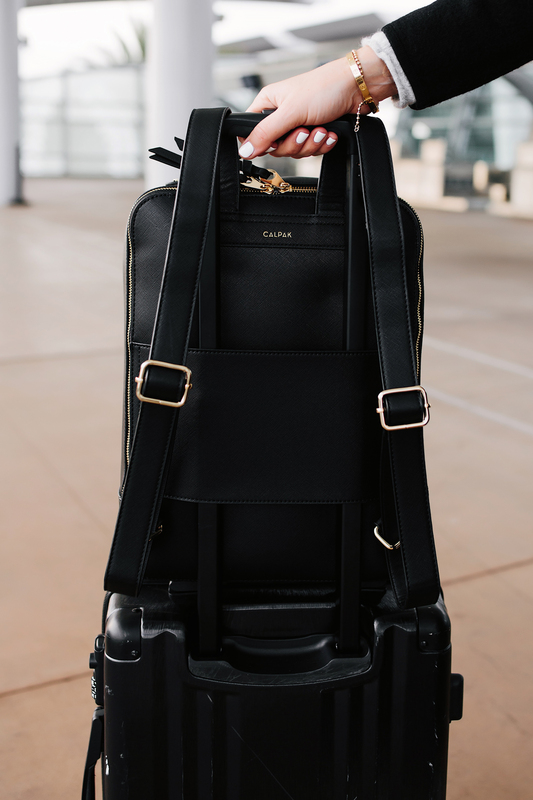 My favorite feature is the back strap that slides over most luggage handles! It's under $100 and comes in a few colors. There is also a round top version as well. I hope everyone has a safe and happy holiday week ahead! For more travel posts read here!